Meeting time: 7.15 (departure at 7.30). Daily departures from April to September. We are comparing Tuscany in One Day Sightseeing from Rome Prices from leading ticket suppliers and Try to find you Cheap tickets prices on the market. Depart early from Central Rome and spend a full day sightseeing in the gorgeous Tuscan countryside. The advantage of this tour is that you be travelling in the company of an expert local guide who knows the in's and outs of the region. You'll also be pretty comfortable onboard your luxury air-conditioned coach as you travel between locations. During the tour you'll visit the Sant'Antonio Abbey, dating back to Gregorian times, as well as historic town such as Montepulciano, where you'll stroll the cobbled streets and visit Punch's Tower. You'll also visit the UNESCO town, Pienza, where historians can marvel at the mix of 15th century and Renaissance architecture. Meanwhile foodies will be eager to sample local cheeses and all passenger will be enthralled by Tuscany's scenic views. The highlight of this trip is exploring the Tuscan wine country. Before the day's out you'll visit an authentic vineyard and wine cellar in Montecito and stop for a 3-course lunch and tasting of locally produced wines in an authentic Tuscan farmhouse. At the end of a full day, you'll return by coach to Central Rome. This tour is for people who escape the busy Italian Capital and get lost in the tranquil Tuscan countryside. Ideal for foodies, wine lovers, history-buffs, and photographers. This is a sociable style tour and therefore suitable for individuals as well as couples, families or small groups. Your Experience With Tuscany in One Day Sightseeing from Rome? Travel by comfortable coach to picturesque locations in the Tuscan Countryside. Enjoy a full day sightseeing with visits to medieval towns. Stop by the UNESCO protected village of Pienza and visit an authentic Tuscan vineyard. Take in scenic views in the Tuscan province. Visit a wine estate and stroll through a beautiful green vineyard with a knowledgeable guide. Take a seat in the winery to sample locally produced wines, taste regional foods and learn about the province from your English-speaking guide. What Tuscany in One Day Sightseeing from Rome Includes? Round trip transportation from Central Rome by coach. Professional English speaking guide and free headphones. 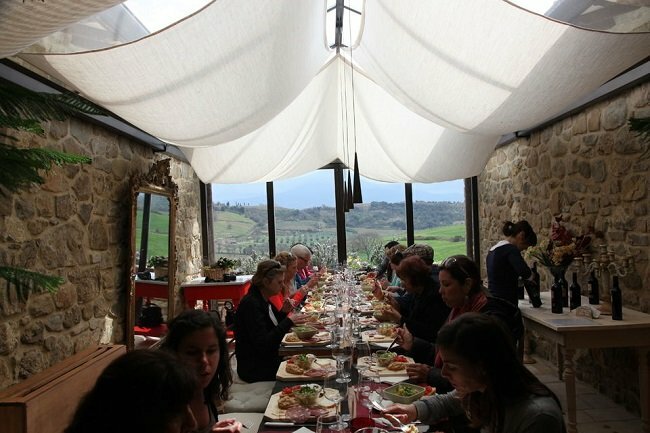 Traditional lunch and wine tasting on typical Tuscan farm and vineyard. Leave central Rome – visit Montepulciano village and Sant'Antino Abbey – lunch and tastings at the vineyard – visit Pienza Village – return to Central Rome. If you have any dietary requirements you can let the tour provider know in advance. Remember that this is sightseeing trip with a fair bit of walking and opportunities to visit religious sights, so, to avoid any problems we recommend leaving the high heels at home. Comfy trainers would be a better choice. Travelers Reviews about Tuscany in One Day Sightseeing from Rome? Tuscany in One Day has a 4.8-star rating from Get Your Guide users. Comments say that this is a wonderful tour with excellent guides. A downside is that there is a lot of driving time on this tour. Viator and TripAdvisor both have 5 out of 5-star ratings for this excursion. Travellers would highly recommend this tour. Paper or mobile tickets will be accepted. Please see cancellation policy when making your booking, tickets are refundable, however cancelation fees may apply. Please inform tour operator of dietary requirements in advance. Comfortable shoes for walking are recommended, and appropriate clothing (long sleeves and trousers/skirt covering the knee) in needed to enter religious buildings.